It’s never too late to share the movies you love and in rounding up my favorite 2014 releases I have put together a list of a few of my favorite oldie movies that I watched. So, here are some films, all before the year 2000 that entertained me throughly one way or another. Yup. 1. 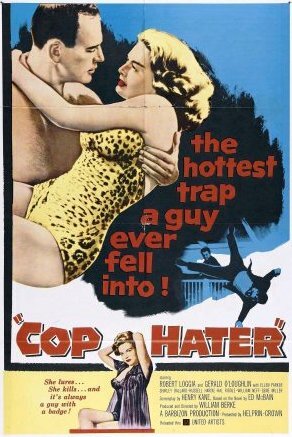 COP HATER (1958) – An early Robert Loggia film where he is Detective Steve Carella in this police procedural set at the 87th Precinct in New York City. During a heatwave two cops have been murdered and Steve and his partner are on the case. It’s a good drama and I loved the who done it angle. It was also great to see actors Jerry Orbach and Vincent Gardenia in cameo roles, both so young! What a time it was in the 50’s to see how those Detectives lived. 2. 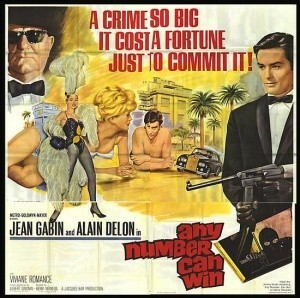 ANY NUMBER CAN WIN (1963) – A french heist film. Mister Charles (Jean Gabin) is released from prison and right away sets things up for a heist at a casino in Cannes. He enlists the help of others, including Francis (Alain Delon). We get to follow along with the whole plan every step of the way and well, I can’t say more, you just gotta see it. 3. 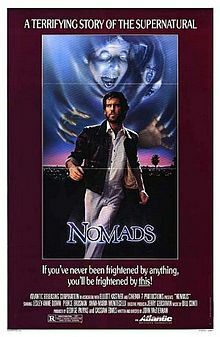 NOMADS (1986) – Finding this was due to a random pick on Netflix and it truly was a great discovery. Young Pierce Brosnan is a French anthropologist who recently moved to Los Angeles. At the start of the film he arrives at the ER in a hectic wild state. Just before he dies he utters some last words to the doctor who attended him and she is then thrust into his life, reliving his experiences. We learn there are Nomads roaming the streets of Los Angeles, though they may just seem like street punks in a gang to the average resident. A fascinating mythology is set up here, dealing with evil spirits. A real highlight to the film for me was actress Mary Warnov as one of the Nomad punks. 4. THE HOTEL SAHARA (1951) – An adorable comedy set during World War 2 starring Yvonne De Carlo as Yasmin and Peter Ustinov as Emad. The two are engaged and running a hotel out in the dessert. As the war campaign continues and each side is storming through the dessert their hotel is evacuated of guests. Yasmin and Emad decide to stay and run their hotel so it is not destroyed and looted by the soldiers who are sure to come storming through. With the help of an employee and Yasmin’s mother they all maintain the hotel for each army faction that makes a stop. It’s truly a delight seeing Yasmin tease and tempt each man in charge while Emad tallies up their bills. The cast was great and it delivered lots of fun. 5. 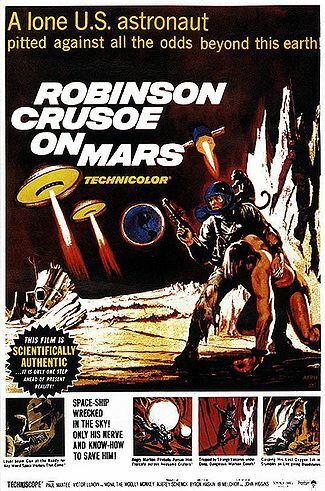 ROBINSON CRUOSE ON MARS (1964) – A clever retelling of Robinson Cruose. We follow an Astronaut who has been stranded on Mars and must find a way to survive. At first he only has a monkey for companionship, and oh that cute little monkey! They have to find a way to get oxygen, food and just stay alive through a series of dangers. It was a technicolor film and looked great, I’d love to see it on a big screen someday. 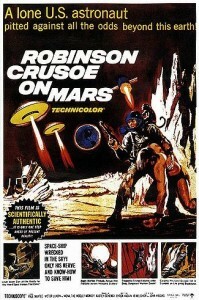 Being a Sci-Fi fan I really dug this space age little film. 6. 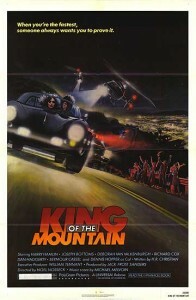 KING OF THE MOUNTAIN (1981) – I got to see this movie on the big screen at the New Beverly Cinema thanks to Mark Heuck and his Cinema Tremens series. It was one of my favorite viewings there! Actress Deborah Van Valkenburgh was also in attendance along with director Noel Nosseck. 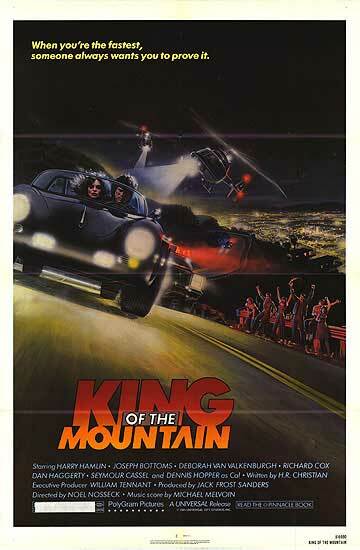 Harry Hamlin is Steve, a mechanic by day, street racer by night. His racing turf is Mulholland Drive and he’s the best of the best. He lives with his brothers (pretty sure they were brothers, or maybe best pals) who also have a love of racing but are now in different careers in the music business. Tina (Deborah Van Valkenburgh), a young upcoming singer comes into Steve’s life and he begins to question his future desires. The film also features Dennis Hopper who works with Steve at the garage and is an ex top dog racer himself. The racing was great. It’s a great capsule of the times too, Los Angeles at the start of the 80’s. Now, here’s two films that are a bit more recent then what’s listed above. These just made me giddy with laughs and I say they are worth checking out too. Yup. 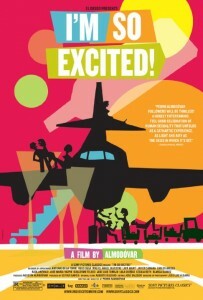 I’M SO EXCITED (2013) – A Pedro Almodóvar film. A comedy. Most of the film is set in an airplane that has some mechanical problems with it’s landing gear. We spend our time with a cast of quirky characters, the three flight attendants who have a flare for entertaining their passengers with musical numbers, and the pilots one of whom is questioning his sexuality. There’s a psychic woman who’s sensing the disaster and looking for love and a few other love triangles are going on in the mix. I honestly found this wildly entertaining and laughed a whole lot. Yup. WALK OF SHAME (2014) – Another comedy makes my list, and I think this film deserves a little more attention. I really like Elizabeth Banks, she’s funny and not afraid to be in comedy. Here she is a television newscaster, Meghan, who is at the cusp of a big break to become an Anchor. After being dumped by her boyfriend and likely to not get her new job she’s left wallowing and sad. Then Meghan’s two best pals show up to take her out for a night on the town. Meghan meets Gordon (James Marsden) and they have a one night stand. It really all gets started with Meghan’s misadventures when she has to get to the studio for her official Anchor audition/interview. She’s Downtown, with no car, no ID and having the hardest time getting people to believe that she’s not a prostitute. It is sometimes crude, but like I said I like Elizabeth Banks, and sure the comic relief pals did their shticks, but it’s a comedy. It was a comedy that didn’t make me feel dumb when it was done, I just got to have some laughs and a fun time. It seems that the big theme for these picks is that they made me laugh. I am pretty picky when it comes to comedy and lately it seems I am looking for flicks that will make me laugh and be happy. Life is always a bit better when you can have a laugh and some fun and I’m glad these movies are here to entertain and make me happy. Thanks movies, you rock! Yup.